with a happy kind of blogging. 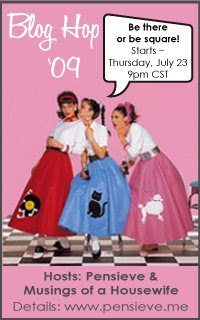 do the '09 Blog Hop." whenever you feel like blogging. 'Cause when you Blog Hop, you feel tip top. Doing the '09 Blog Hop. So, yeah, join the party. Drop by Robin's and find some new peeps to visit. That's what I'll be doing. [And if you really want to get to know me, may I suggest the condensed version? Sorry to say...I always hated that purple dinosaur...was thrilled my kids never fell in love with him! Baby Bop Hop, hee hee! Nice to meet you. My son, who is now 16, was a HUGE Barney fan. So yeah, I know the Baby Bop Hop! I always swore before I had kids, that I would never,ever,ever,ever,ever let them watch Barney. The things we say before we become mommies. Luckily, we don't watch him too much, cause I seriously think I would just lose it! My name is Christy, and I'm a Barney hater. My two boys loved Barney. My husband has banned it for my daughter. LOL Hmmm little does he know when he is at work. LOL Stopping by from the blog hop to say hello. Just hopping by to say hi. Funny barney and baby bop impression..lol! Have a blessed weekend. I love it! Every bit of it....from the song to your list in the condensed version, to the fun life you've led so far! I'll definitely be back! Great to meet you! I dislike barney, not sure why but I always have. Hopefully my kids won't like him. Happy bloghoping! 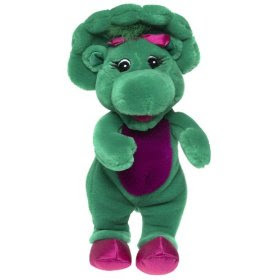 Dear God, baby bop? I hate Barney. One of the reasons I waited so long to have kids was because I was hoping Barney would become extinct. Then my evil sister-in-law gave us Barney videos. I can't think of retribution evil enough.